(CN) – The list of missing people in the Camp Fire raging through Northern California climbed to more than 600 people and the death toll rose to 63, law enforcement officials said late Thursday. The toll from the deadliest fire in California history continues to worsen even as the blaze diminishes in intensity and firefighters are finally gaining the upper hand in corralling the 145,000-acre blaze, with containment listed at 45 percent. 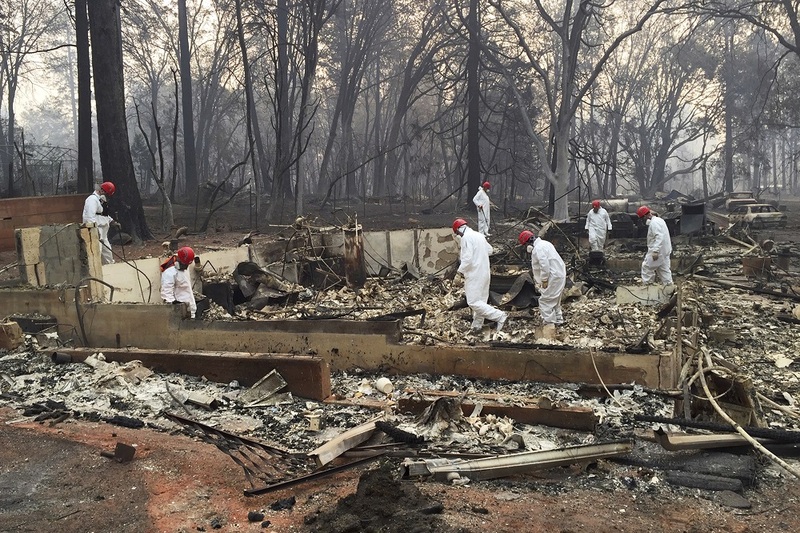 But search and rescue crews and forensic analysts specializing in recovery of human remains continue to comb the town of Paradise, which was reduced to rubble in a matter of hours by the Camp Fire. The towns of Magalia and Pulga, small foothill outposts in a picturesque part of Northern California, have also been nearly burned off the map and account for several of the fatalities and many destroyed buildings. All told, the Camp Fire has destroyed 9,000 houses and about 230 commercial buildings, along with 2,076 other buildings, according to the latest estimates provided by Cal Fire. Three firefighters have been injured while combating the blaze. Thousands of refugees now live in makeshift tent cities around the region, including the Butte County Fairgrounds. A norovirus outbreak at a camp in a Walmart parking lot in nearby Chico forced city officials to shutter the tent city and ask people move to other shelters cropping up across Northern California. Officials acknowledged many of the 631 people on the missing list may in fact be safe and unaware people are looking for them. Butte County made the list public and encouraged people on it to contact law enforcement and let police know they’re safe. In the wake of what is now the deadliest and most destructive wildfire in state history, questions about whether Paradise had an adequate evacuation plan are beginning to emerge, as former residents tell their harrowing stories of near escape. Some say they received alerts only when the fire was on the edge of town, while others say they received no warning at all. “The fact that we have thousands and thousands of people in shelters would clearly indicate that we were able to notify a significant number of people,” Honea said. In the wake of the North County fires, which killed about 43 people in Napa, Sonoma and Mendocino Counties in October 2017, Governor Jerry Brown signed a law to develop statewide guidelines for an Amber Alert-like warning system. But Paradise is nestled on a saddle-like ridge between two higher hills, meaning there is only one route out of town and gridlock will naturally occur in an event of mass evacuation. Meanwhile, the smoke from the fire has settled over much of California, creating the most hazardous air conditions in the world. Residents from Bakersfield to the Oregon border and beyond have been advised to stay indoors or purchase masks to protect their lungs.